Capacitor discharge welders – Kočevar in sinovi d.o.o. Capacitor micro-welding machine is used where welding technology demands very short and exactly measured strong electric current strokes, because the shortest time in capacitor welding is few mili seconds for the difference from the classic ressistance welding machines, where the shortest time is 0,5 – 1 period (10-20 milisecs). It is mostly used in electonic, electro, fino-mechanic and optic industry, because it enables welding of practically all metal combinations, which are used in modern technology. The usage of these machines is obligatory when welding high-temperature materials and electric conducting. Under special conditions we can weld copper-copper and copper-alluminium. 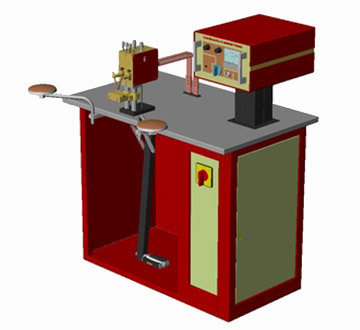 The recent acomplishments on the ressistance welding field are used in the construction of this machine which uses the condensated energy when welding demands exact measurements of energy in the welding point. Precisely stabilisating energy is very important because the changing of the net tension for 10% makes the change of temperature in the welding focus for 21%. The exact dosation of energy in this machine is 0,5%.